Fine southwestern bedspreads are an investment in your comfort, warmth and the beauty of your home. Shown above is a bedding ensemble called the Sierra which features a duvet cover with a bold geometric southwestern design in a rustic combination of red, brown, black and cream. Perfect for your decor whether you prefer cabin, southwestern, western or rustic style. The duvet cover is complemented by matching shams, accented throw pillows (of different shapes, sizes and textures) and a faux suede bedskirt with a center pleat beautifully detailed with studs and conchos. Each piece in the southwestern bedspread collection shown above is sold separately. Since our bedding is made to order, please allow six to eight weeks from order to shipment time. Sorry, but we cannot accommodate rush orders. Pictured above is our earthy collection of bedding toppers made especially to complement the Sierra style duvet cover. In front of the shams is the neck roll; behind the shams are the square Euro shams in a contrasting fabric. Southwestern Shams Note: Shams do not come with inserts. Southwestern Bedspread Accents Note: shams do not come with inserts. Minimum order: You must order a duvet cover, but do not have to order the other options. Just select "No ..." from the drop down menu for each option that you do not want to order. Shipping is via UPS Ground. Shipping costs will be added to your order based on your location. We charge you what it costs us to ship and do not pad our shipping costs. 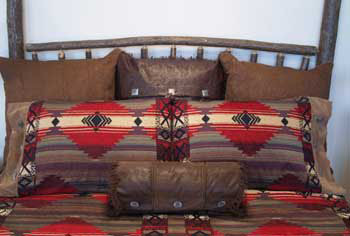 Order your southwestern bedding pieces today!